For thousands of years, the Bal Ej practiced Judaism in secret - now they are reemerging, and they want to come home to Israel. Earlier this year, the Israeli government announced it plans airlift 500 family members of Ethiopian-Jewish soldiers to Israel, as part of Interior Minister Silvan Shalom's vow to "complete" the aliyah of Ethiopian Jewry back Israel. Israel brought most of the community to Israel during the 1980s and 90s in what was dubbed Operation Solomon, with others following them in subsequent years. There are currently around 135,500 Jews of Ethiopian descent living in Israel, including more than 50,000 native-born Israelis. The ancient community was exiled from Israel in pre-Talmudic times, and spent much of its long exile largely cut off from other Jewish communities, resulting in a unique set of customs and practices. Some - known as the Beta Israel - preserved their Jewish identity despite harsh persecution, while others - often known as Falash Mura - were forcibly converted to Christianity, in some cases practicing Judaism secretly. 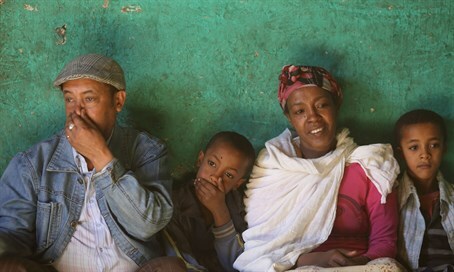 But just as Israel poises to "wrap up" the return of Ethiopian Jewry to their homeland, an upcoming documentary by Jewish filmmaker Irene Orleansky reveals another reemerging community in the heart of the Horn of Africa state. Known as Bal Ej, like many other Beta Israel they too were forced to keep their Judaism a secret due to persecution - in some cases far worse than their brethren elsewhere in the country. A short teaser to Orleansky's documentary - Bal Ej - the hidden Jews of Ethiopia - gives some background on a fascinating, ancient Jewish community emerging from the shadows after generations of suffering. Arutz Sheva spoke with Orleansky about her project, to find out just who the Bal Ej are. Tell me more about the history of the Bal Ej. How do they differ from the other Beta Israel/Falasha communities from elsewhere in Ethiopia? Do they have ties to other Ethiopian Jews? How many of them are there in Ethiopia, and have any moved to Israel or elsewhere in the Diaspora? Do they have a formal communal leadership? Bal Ej means craftsmen in Amharic. According to their oral history, they originate from Beta Israel of Gondar region. A story of their migration from Gondar region to North Shewa region was also documented by Jacque Faitlovitch, a prominent researcher of Beta Israel, in his journey diaries in 1910. The community was also mentioned in earlier documents as long ago as in 1840. They migrated from Gondar to North Shewa region in a few waves beginning from the 15th century with the largest wave in the 19th century at the time of rule of Menelik II who brought them from Gondar to North Shewa to build his capital Ankober, and later Entoto and Addis Ababa. The weapons produced by Beta Israel craftsmen of North Shewa played an important role in military success of Menelik II. The traditions and practices of Beta Israel of Gondar and North Shewa are essentially identical. They practice animal sacrifice and follow strict purification laws typical for Beta Israel. They also strictly observe Shabbat, circumcision, and dietary laws. But unlike the Beta Israel of Gondar who practiced Judaism openly, the Beta Israel of North Shewa were forced to act outwardly as Christians and practice Judaism in strict secrecy to avoid severe persecutions and discrimination. Even Faitlovich mentions in his book "My Second Trip to Abyssinia" that they live in North Shewa in conditions of slaves with no right to return to their homes. Another difference is that all their writings were confiscated by Coptic Orthodox Church or lost during migration, therefore their traditions were transferred from generation to generation only orally. Not only that they lost ties with their kinsmen in Gondar, until recently they did not known that Beta Israel of Gondar are already in Israel. More than that, they did not know that the State of Israel was reestablished and that there are other Jews in the world. This knowledge came only in recent times, when the younger generation started migrating from villages to the city and got access to information. Until today they continue practicing Judaism in secrecy. Today there are fourteen secret synagogues, or rather monasteries (a common practice for Beta Israel), all located in remote inaccessible places in the mountains of North Shewa. Male elders of secret synagogues are called abba, and female are called ima [Hebrew for "father" and "mother" - ed.] They live in the synagogue compounds, praying and transferring their knowledge to next generations. About ten years ago the youth of the community opened their own synagogue in Kechene, a craftsmen neighborhood of Addis Ababa. This was first met by elders of the community with antagonism, but today many elders support this move. It is hard to evaluate the exact number of Beta Israel in North Shewa since most still practice in secrecy. As for the Kechene youth who practice Judaism openly, they are about two hundred. None of the community members is in Israel, but a few are currently in the USA for work or studies. Have they been practicing Judaism secret as Jews for all these years, or were they - like many other Ethiopian Jews - forcibly converted, and only returning to their Jewish roots now? Unlike most Ethiopian Jews known as Falashmura, who converted into Christianity and have recently returned to Judaism, the Beta Israel of North Shewa have never abandoned Judaism, but practiced it in secrecy. Unfortunately young people of Kechene are beginning to abandon and forget their roots. In spite of this, there is no assimilation even among the youngsters who have recently abandoned Judaism. Like the Beta Israel of Gondar, the Beta Israel of North Shewa are believed to be "buda," or evil eyed, and "jib", people who turn into hyenas during the night. This superstition in a way has preserved the community from assimilation for centuries. To this very day, no outsider will step his foot into the neighborhood of craftsmen, and if he has to do so, he will tie a clove of garlic to his arm which is believed will protect him from evil eye. Marriage between Beta Israel and other communities is a taboo. Even though the community members have never lost the traditions and customs of Orit (Torah), it is only the younger members who have recently started learning about rabbinical Jewish practices. The elders do not know such holidays as Purim or Hanukkah and pray in ancient Ethiopian language Ge'ez. What is the song they're singing in the trailer to your documentary (above)? The song is called "Senbet leyu nat" which means "Shabbat is unique". In this song Shabbat is addressed in feminine form and praised as a unique day given for eternal observance. This song was originally in Ge'ez, but the youngsters translated it into modern Amharic. This is the song that is sung during the ceremony of welcoming Sabbath (reminiscent of "Lecha Dodi" in other Jewish communities). - What prompted the community to "come out" after so long? What prompted the community to come out is the desire to reconnect more strongly with their Jewish roots and the rest of the Jewish world as well as fear that their identity will be lost forever in just one or two generations. - Do they receive support from elsewhere in the Jewish world? Some Jewish organizations and individuals have visited the synagogue in Kechene, but the community has not received much support. The secret synagogues have never been visited by strangers at all, and I am proud and privileged to have been granted such an opportunity. The community is economically independent. Many of the youngsters are with college and university degrees, while most elders are still practicing crafts because of lack of education and because in rural areas land is still not given to "falashas" no matter how many crosses you tie around your neck for disguise. Therefore more successful and educated people in Kechene financially support the secret synagogues and surrounding villages, where most of the community members are elderly people. - Do they want to make aliyah, or do they wish to stay and practice as Jews in Ethiopia? To my knowledge, they wish to make Aliyah, since returning to the land of their forefathers has been their aspiration for centuries. - What kinds of challenges do they face? In rural areas, murders and property damage are still common. Every time that a Christian gets sick or dies, it is believed that it is because of the curse of the "hyena people". So Christians come to the village of Bal Ej and take "revenge." Almost every month I hear about a murder of a community member. In Addis Ababa, the main problem is the lack of Jewish cemetery or at least a civil burial ground. If a community member dies and at his life time he practiced Judaism openly, he will be refused to be buried at a Christian cemetery. Sometimes the community members have to take the body of the deceased kilometers away in search of a burial place. - You have traveled to a wide range of far-flung, "exotic" Jewish communities - are there any others you wish to visit in the future? I would definitely like to visit all of them. Each of them is truly unique. And I would definitely like to share their stories and cultures with the world. And I would like to use this opportunity to send them love and wish them peace, security, good health and success.